Travel with Carlisle, Craig and friends across Australia as they visit the blood red dunes of the Simpson Desert, discover the hidden gems on Western Australia's wild coastline and explore some of the Flinders Ranges' best tracks and properties. Along the way they meet up with characters living their own dreams, from lobster fishermen in Cervantes to Doug Sprigg, who was on the first vehicle crossing the Simpson Desert. So pack up your fourbie, dig out your maps and hit the road with 4WD Touring Australia. Seen the DVD? Why not check out 4WD Touring Australia magazine HERE. Printed monthly, each issue is packed full of travel tips, reviews of camper trailers and offroad caravans and 4WD technical advice. Be inspired by the stunning photography, and plan your own adventures whilst reading about Carlisle and Craig touring around Australia! What a great series, this honestly had me glued to the telly for hours. Just the right mix of in-depth travel info, awesome scenery and real practical 4WD tips. 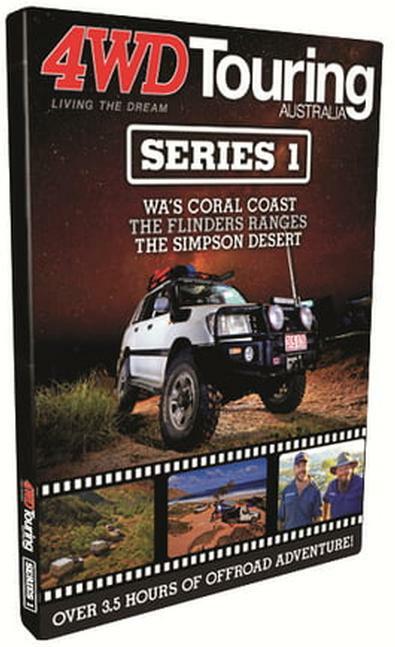 I’ve shown this series to a couple of my 4WDing mates and they are all loving it. Here’s a 4WD series that really inspires you to get out there and see some of this country’s special places. The places these guys get to are some of the greatest in the country and the quality of the filming is just unreal. I’m not one to normally watch a lot of TV but this series really grabbed me. I watched the whole series in just a day! This is a real high quality production and an inspiration for those of us that don’t get out there quite as much as we would like. Watching this series made me feel like I was out there myself and has given me plenty of food for thought for the next couple of trips. There were some great looking 4WDs and campers included which is always good to see.